This section, covering almost 91 miles, offers the hiker some of the most astounding scenery in northwestern North Carolina. This part of the trail, which travels along the ridgeline where elevations range from 4,300 to 3,400 feet, offers views looking down the escarpment into the North Carolina Piedmont. 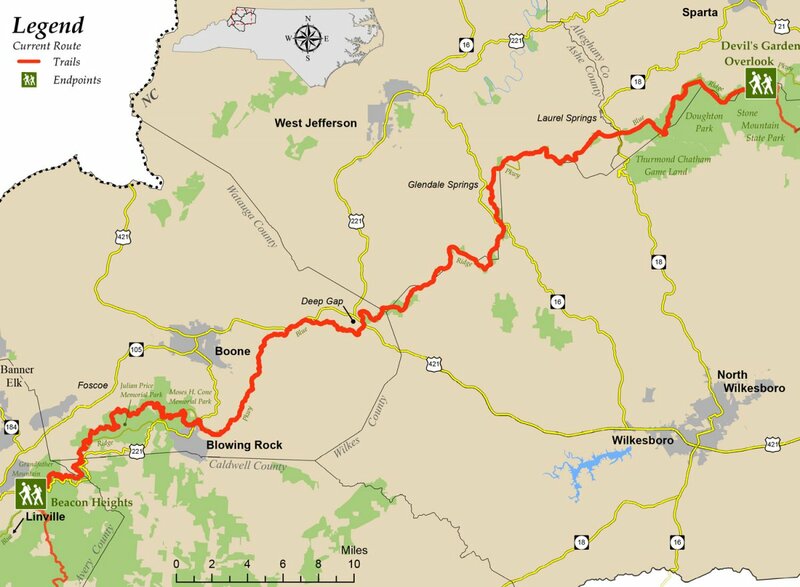 Most of this section runs parallel to the Blue Ridge Parkway (BRP) and often crosses the parkway as the trail goes back into the woods and away from the road. There are a few stretches that cross fields, which will sometimes share space with friendly cows. 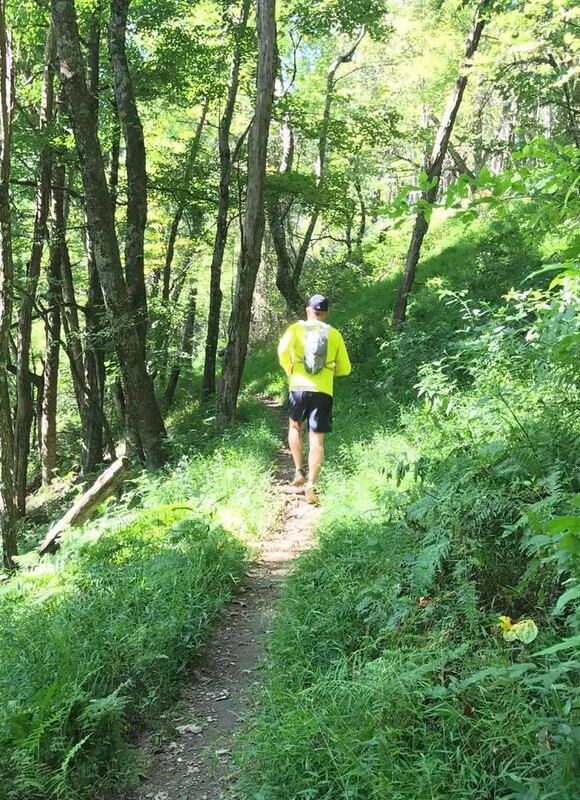 There are also a few patches where the trail travels along a backroad or the shoulder of the BRP, but most of this segment is on well-engineered footpaths that make the ascents and descents easy to hike. Although the BRP is always nearby, you often feel that you are deep in the woods, miles from civilization. This section begins at Beacon Heights and follows the Tanawha Trail as it travels along the base of Grandfather Mountain, which is one of only 553 certified biosphere reserves in the world. It continues past the resort town of Blowing Rock, travels near West Jefferson, and ends near Sparta in the northwest corner of North Carolina near the Virginia border. 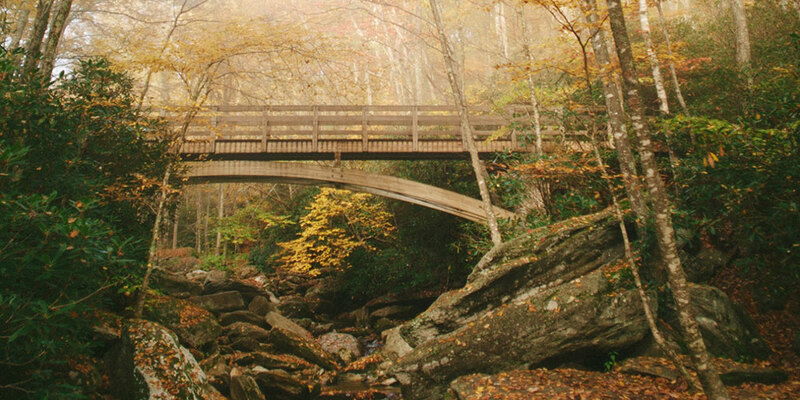 The nearby towns of Linville, Blowing Rock, Boone, West Jefferson, and Sparta offer all amenities. They also make it easy to break this segment into several day hikes. Thanks to the following for their assistance: Dave Bauer, Allen de Hart, Nancy Dexter Wilson, Tom Dillon, Jim Hallsey, Randy Johnson, John Lanman, Doug Smith, and Jane Wallace. Four new primitive backcountry campsites along the Blue Ridge Parkway opened in August 2017, and the rules for use of a previously existing campsite (H1 below) have changed. These four backcountry campsites are intended for MST thru-hikers and section hikers; stay is limited to no more than two consecutive nights on a first-come, first-serve basis and requires a BRP/NPS backcountry use permit. Click on the campsites listed below for more information and directions. Bench & firepit with grate but no amenities; get permit from Price Park campground office MP 296.9 (May-Oct) 828-963-5911; Sandy Flats Ranger Station MP 294.5 (Year Round) 828-348-3487. Maximum of 12 campers allowed. 0.1 At intersection with Tanawha Trail, which runs conjunctively with MST for next 13 miles of this segment, turn left (north). In 20 yards pass trailside NPS Backcountry Camping Permit self-registration box. Complete permit ONLY IF CAMPING IN ONE OR MORE OF THE FOUR NPS backcountry campsites located on the MST in Segment 5 (Highlands District, Blue Ridge Parkway). 74.4 Come to Old Johns River Road Backcountry Campsite (H1) with bench and fire pit with grate but no amenities. Permit required from Price Park campground office (May-Oct) or Sandy Flats ranger station (year round). Maximum of 12 campers allowed. Limited tent space, no fires, leave no trace rules. Maximum 6 campers. Get permit from Price Park campground office MP 296.9 (May-Oct) 828-963-5911; Sandy Flats Ranger Station MP 294.5 (Year Round) 828-348-3487. OR Doughton Park campground office MP 239.2 (May-Oct) 336-372-8877; Bluffs Ranger Station MP 245.6 (Year Round) 828-348-3487. 31.8 Trail goes under large fallen tree, immediately followed by creek crossing, which requires rock-hopping and may dampen your shoes. Ascend to follow old roadbed north for 300 feet to Goshen Creek Backcountry Campsite (H2) access trail on right. Follow blue blaze access trail through rhododendron 120 feet to single campsite before fallen oak tree. No fires. Permit required from Price Park campground office (May-Oct) or Sandy Flats ranger station (year round). Maximum of 6 campers allowed. 58.1 Continue on MST to impressive footbridge over cascading High Shoals Creek. Note: Excellent photo op here. 58.4 Access trail to Goshen Creek Backcountry Campsite (H2) is on left before descending old wood road. Follow access trail through rhododendron 120 feet to single campsite before fallen oak tree. No fires. Permit required from Price Park campground office (May-Oct) or Sandy Flats ranger station (year round). Maximum of 6 campers allowed. 58.5 Come to creek crossing, which requires rock-hopping and may dampen your shoes. Trail then goes under large fallen tree. Trail winds across ridgeline, then descends to bridge. Climb steps up to George Hayes Rd. Limited tent space, no fires, leave no trace rules. Maximum 12 campers. Get permit from Price Park campground office MP 296.9 (May-Oct) 828-963-5911; Sandy Flats Ranger Station MP 294.5 (Year Round) 828-348-3487. OR Doughton Park campground office MP 239.2 (May-Oct) 336-372-8877; Bluffs Ranger Station MP 245.6 (Year Round) 828-348-3487. 41.2 Cross BRP and enter woods on east side. Go uphill 810 feet. At start of switchback follow blue blaze access trail on right 130 feet to Deep Gap Backcountry Campsite (H3), two 10’x12’ tent pads. No fires. Permit required from Price Park campground office (May-Oct) or Sandy Flats ranger station (year round). Maximum of 12 campers allowed. Continue uphill to crest of knoll to white pines, then down switchbacks and back uphill to BRP. Turn right and walk on shoulder for 472 feet to Osborne Mountain Overlook (MP 278). 48.3 At south end of parking area, continue along shoulder of parkway for 472 feet. MST then goes downhill into woods on east (left) side of BRP. Trail descends then goes uphill through switchbacks before going through stand of white pines. 49.0 Descend toward dead pines and switchback. At end of switchback blue blaze trail to left leads 130 feet to Deep Gap Backcountry Campsite (H3), two 10’x12’ tent pads. No fires. Permit required from Price Park campground office (May-Oct) or Sandy Flats ranger station (year round). Maximum of 12 campers allowed. MST continues downhill through woods to parkway. 55.5 At end of fence, trail enters laurel/rhododendron thicket then goes into forest with fern-covered floor. Trail goes up and down hills but steep ascents and descents never go more than 200 feet before leveling out. 56.3 Obids Creek Backcountry Campsite (H4) access trail is on left just beyond second switchback (past a 12 inch birch, a 12 inch locust and before a 24 inch white pine). Follow blue blaze trail 350 feet ascending to two 12’x12’ tent pads. No fires. Permit required from Price Park campground office (May-Oct) or Sandy Flats ranger station (year round). Maximum of 12 campers allowed. Water (Obids Creek) is 525 feet past campsite on blue blazed trail at small waterfall in notch of low rock ledge. 56.5 After switchbacks, trail comes into clearing. Trail crosses clearing going away from BRP towards the woods. Watch for white dots on trees. Trail passes Christmas tree farm with large pond on left. Trail ascends and makes sharp left turn near BRP. Trail descends 300 feet to wooden steps at switchback. It’s 100 feet to open field. 0.0 Segment 5 begins at Devil’s Garden Overlook on BRP (MP 235.7). This is 6 miles from the intersection of US 21 and BRP. Sparta is 7 miles north on US 21; Elkin and I-77 are 25 miles south on US 21. Cross BRP to west side and begin ascent. IF CAMPING IN ONE OR MORE OF THE FOUR NPS backcountry campsites located on the MST in Segment 5 (Highlands District, Blue Ridge Parkway), you will need to backtrack about 20 yards (into Segment 6) to the trailside NPS Backcountry Camping Permit self-registration box and complete a permit. Trail descends and ascends, paralleling BRP. Pass large rock field and see BRP stonework. You will cross a small creek with BRP high above on left. Descend out of the woods to BRP. 33.2 Trail re-enters woods. Come to wooden steps at switchback as trail ascends. Trail comes close to BRP at top of hill, then makes a sharp right turn to begin descent. Pass a Christmas tree farm with large pond on right. Cross a clearing with BRP visible to the left, but MST goes away from parkway to re-enter woods. 34.0 Trail ascends gently then levels out before switch back to left. Obids Creek Backcountry Campsite (H4) access trail is on right just before switchback. Follow blue blaze trail 350 feet ascending to the first of two 12’x12’ tent pads. No fires. Permit required from Price Park campground office (May-Oct) or Sandy Flats ranger station (year round). Maximum of 12 campers allowed. Water (Obids Creek) is 525 feet past campsite on blue blazed trail at small waterfall in notch of low rock ledge. Trail goes up and down hills but ascents and descents never go more than 200 feet before leveling off. Walk through a beautiful forest where trees tower over fern-covered floor. Trail then enters laurel/rhododendron thicket before coming to fence line. Note: This fence is electrified. Walk along the fence before coming out of the woods. 34.8 MST comes back to BRP. Walk 600 feet on shoulder and re-enter woods. Trail comes out of woods at BRP. This section of the MST can be enjoyed as a series of day hikes. Each link below provides the information you need to hike a sub-section of the trail. Day Hike 10: Oh, fudge!